Welcome back to our recipe round-up after our break last week. I hope you’ll share last week’s and this week’s recipes today. Feel free to share as many as you like just link back to this post in each one. If you missed the event on May 5th you should check out the great recipes shared. So what is going on in your real food world and what happened to Jamie Oliver’s show? What could be more important than working to get good food to our kids at school and high sugary flavored milk drinks out? Have you joined the push to get those out of schools? If not and you’re interested visit Jamie Oliver’s website School Food section and his Facebook group. There’s a big event happening on June 9th. Oh and Jamie’s Food Revolution will return to TV in June. OK now let’s get to the recipes this week. Please link back to this post so your readers can find lots of great recipes. Link to your individual post, not your home page. Please share recipes made with very little packaged ingredients but using single food ingredients or Real Food. Maybe 1 or 2 if the list of ingredients is long. If I bake something I’m usually using almond flour but I didn’t make it myself. So you see where I’m going with this. Please do not link giveaways or book reviews, this is for recipes with Real Food. Now hopefully that doesn’t seem to difficult. 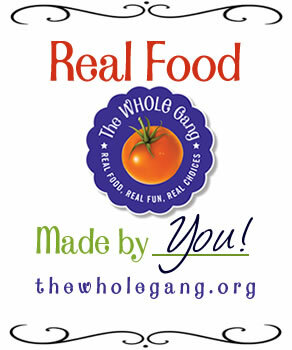 The point is to share Real Food with Real People! Please don’t make me be a meanie and have to remove your link if you don’t follow the guidelines. When you share your recipe feel free to grab one of these badges, or as Tia calls it Real Food Bling, and add it to your post. You can even add it to your blog sidebar. You can find these on the page dedicated to Real Food Weekly. Now look below for the words, Click Here To Enter so you can link up your recipe! Thank you. I shared my delicious grilled grass fed tri tip roast. I hope you like it! Hi Diane. I'm submitting a chicken and broccoli stir fry. Now I'm off to BlogHer Food 2011. Wish I was meeting you there! This week I'm sharing a guacamole recipe that comes from good friend. Thanks for hosting! I am sharing my recipe for Strawberry Ginger Rhubarb Crisp. 🙂 I hope you'll try it and let me know what you think. Thank you Tressa for sharing. I just tried rhubarb for the first time this weekend and now I'm hooked. I almost forgot to link up my vegan/gluten free/allergy friendly soup this week! Thanks as always for hosting! Thank you Libby for sharing!